Linux is a free and open source operating system. Linux and another open source operating system can use and load device drivers without publicly available source code. These are vendor-compiled binary drivers without any source code. Commonly known as Blobs. Die-hard open source fans and Free Software Foundation (FSF) recommends completely removing all proprietary components including blobs. This posts list seven best Linux distribution that meets the FSF’s strict guidelines and contains no proprietary components such as firmware and drivers. Good news for all developers! QT will be available under the LGPL starting with version 4.5. The GNU Lesser General Public License (LGPL) is a free software license published by the Free Software Foundation. The LGPL places copyleft restrictions on the program itself but does not apply these restrictions to other software that merely links with the program. There are, however, certain other restrictions on this software. The LGPL is primarily used for software libraries, although it is also used by some stand-alone applications, most notably Mozilla and OpenOffice.org. This option could increase Qt usage and adoption. 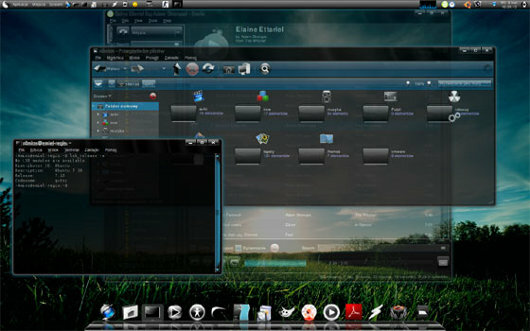 You may see more cross platform commercial application on the Linux desktop. This is huge news for cross-platform developers. * There should be no actions on notifications. * Notifications should not be displayed synchronously, but may be queued. Our implementation of the notification display daemon will display only one notification at a time, others may do it differently. I think new changes looks more like Growl system used in Mac OS X. You can read more about proposal including mockup video that shows new notification system here. Awesome! Here are few more Linux customization resources for you. Most of the Linux users should be familiar with Gnome and KDE since both of them are the most commonly used desktop managers in the various Linux distros. Now, if you are using an old PC with low hardware specs, you might find that the above two desktop environments are too heavy for your computer to handle. In this case, you will have to consider using an alternative lightweight desktop manager for your Linux. Here are 8 of the best lightweight desktop managers that I personally use and recommend. What will desktop Linux be like four years from now? InfoWeek has an interesting article about the open-source future – What Linux Will Look Like In 2012. Flickrfs is a virtual filesystem which mounts your Flickr account on a Linux machine, allowing you to browse through your photos as if they were on a locally connected drive. You’ve just download the latest and greatest version of Ubuntu Linux and it didn’t cost you a thing. You breezed through the installation and a brand new desktop is staring you in the face — now what? There are a few things you’ll need to do if you want to get the most out of your Linux desktop. But don’t worry, none of this is too complicated. In fact, it’s much easier than trying to do the same on Windows or a Mac.